As you can see, I am quite delayed but here it finally is!!! 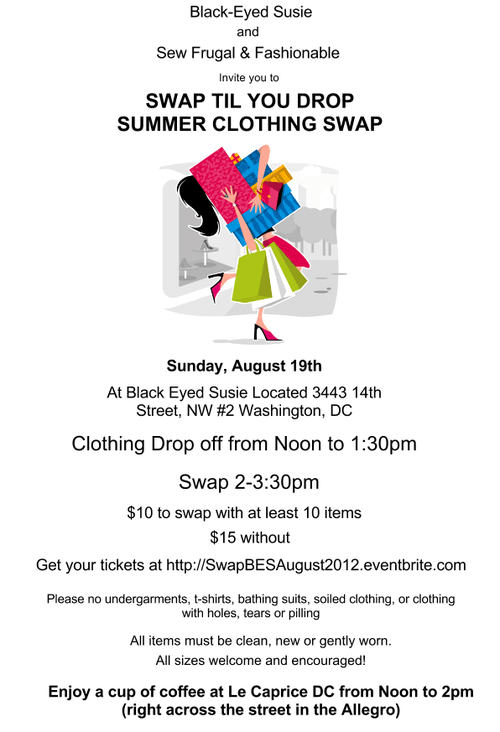 Last month I went to another awesome clothing swap at Black-Eyed Susie and before I get into how awesome it was I would first like to tell everyone to go out and check out her store!!! It is a really awesome spot and I personally wanna keep it around so more people need to go out and show it love!!! It is a really cute spot so if you haven’t been there, go soon!!! We already lost it’s Vintage Darling, let’s not lose another treasure. Now to the swapping!!! The only con about this show is that it is a little small come swapping time. I have found myself stuck in the corner a time or two, however I keep coming back because despite that, I always come away with some awesome finds. As I did the first time, I left with quite a few new items for my closet. In fact, I ran into a few ladies from the last time and they again commented on how was I finding so many treasure so it made me think, what are my swapping secrets?! Volunteer!!! : If you get the opportunity, volunteer to help out!! Most swaps appreciate the extra hands and it gives you a sneak preview of what is going to be on the floor. Now to be fair, most places will not let you shop early which I think is valid but you do get to see what you might want to score when it starts. Get there early! The earlier you can get on the floor, the less picked over the items are so you can have first choice of what is there. DO NOT HESITATE!! If you see something you like, pick it up! Because it is likely that if you go back for it later, it will definitely be gone. It is much easier to put something back than it is to pick up something that you missed. Circle back twice: People often put things back that don’t fit or they change their minds about so be ready to snag them once they are put down! Stick around until the end if you have time and volunteer again. Most places need help packing up the clothes for donation. Last swap, I found three pairs of jeans that fit me perfectly during clean up. Do you know how rare it is to find jeans that fit perfectly?! ?